Although basketball is a team sport, there are a number of individual skills you can improve by practicing alone. Passing, shooting and dribbling are some of the skills you can practice anytime. The key to getting the most out of your individual workout is to push yourself and move as quickly as you would during a game. Practice dribbling the ball as low as you can, alternating between hands. Do figure-8 drills by dribbling the ball around and through your legs, moving the ball from your right to left hand as you go. Set up a line of cones in a zig-zag pattern, and alternate dribbling moves to change directions at each cone. For example, dribble to the first cone, then do a simple crossover dribble. At the next cone, dribble between your legs to change direction, then go behind your back or use a spin dribble at the last cone. Increase your speed each time you pass through the cones. Start by practicing your form without a ball. Work on getting your feet set, forming your shooting pocket with your arm bent and elbow lined up with the basket and using a proper follow-through. Warm up for shooting by standing in front of the basket and trying to make five shots in a row without hitting the rim. Move back two steps and repeat. Play shooting games that simulate game conditions, such as shooting without dribbling, shooting after one dribble, shooting using a fake or taking a last-second shot. Set goals to challenge yourself. For example, aim to make a certain number of shots in a row by a certain date. Use tape to mark passing targets on a wall. Stand 10 feet from the wall and practice hitting the targets by using a variety of passes. Alternate between two-hand passes and one-hand passes, using your right and left hand. As you improve, make passes from farther away and practice passing off the dribble. Challenge yourself to hit the target 10 times in a row. Work on pivoting and protecting the ball from the defender when making passes. Perform basketball-related exercises to improve your conditioning. Perform push-ups to build upper-body strength. 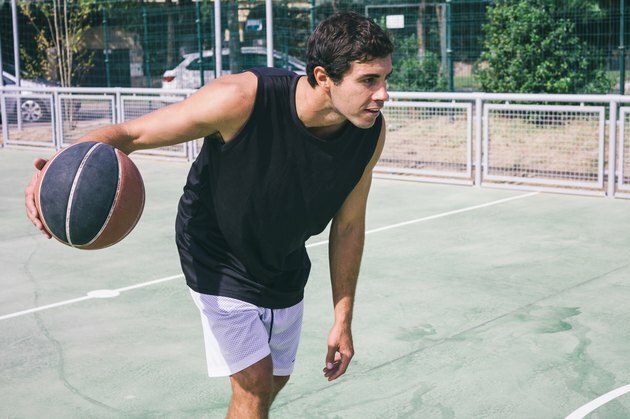 Run sprints up and down the court to improve your cardiovascular fitness and do quick-burst jumping drills to improve your ability to jump from a standing position, such as when rebounding in a game. One such drill involves standing under the basket and jumping, trying to touch the backboard 10 times in rapid succession. An area that is sometimes overlooked is defensive footwork, which involves sliding your feet quickly and changing directions frequently. Designate an area on the court to use for sliding side-to-side, and choose a time period to do nothing but slide between two points. Keep track of how many times you go from one side to the other and try to improve each time you do the drill.